Here's the extremely rare Leia Bespin 12" action figure that was planned for the Empire Strikes Back extension of Kenner's Star Wars large action figure line. Only a handful of Leia Bespin doll prototypes were made, yet the concept did not go forward to production. Box flats were printed for this figure along with boxes for Han Solo in Hoth outfit and Luke Skywalker in Bespin outfit which were also part of this planned ESB line extension. 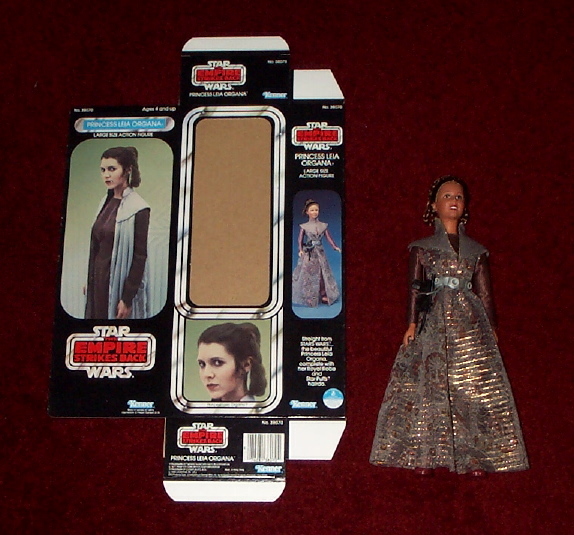 Very few authentic Leia Bespin doll prototypes have surfaced today. This one features a version of the Princess Leia belt with a loop to hold a blaster designed especially for the Leia in Bespin outfit. This doll has different hair rooting than the original Leia 12" action figure and is designed to match Leia's Bespin hair style as seen in the Empire Strikes Back.